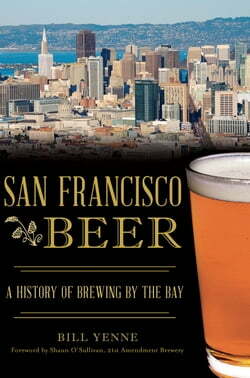 The story of beer in San Francisco is as old as the city itself. San Francisco had its first commercial brewery by 1847, two years before the gold rush, and went on to reign as the major brewing center in the American West through the nineteenth century. From the 1930s to the early 1950s, iconic San... read more Francisco–based breweries Lucky and Acme owned the statewide California market. In the 1960s, Fritz Maytag transformed San Francisco’s tiny and primitive Anchor Brewing into America’s first craft brewery. Now, well into its fourth generation of craft breweries, San Francisco has seen more new breweries open in the second decade of the twenty-first century than were opened in the entire previous century, proving that tech is not San Francisco’s only booming industry. Join local author and beer enthusiast Bill Yenne as he explores San Francisco’s rich tapestry of beers and breweries that have made it a brewing capital in the West.